I know, I know. Cauliflower. It doesn’t sound terribly delicious or all that exciting BUT it IS! And to tell you the truth I’ve been so side tracked and having such a good time with PFB that I’ve gotten a little behind. Thank goodness I made this some time ago and stashed it away for days like this when I get in a jam. That’s not to say I haven’t been dreaming of this cauliflower. In fact, I just bought another head this weekend just for this recipe. I just need to make it now. Not today though, I’m diligently working on the next TWO PFB’s. Wish us luck please. This is another great recipe from Steven Raichlen’s arsenal of awesome recipes. Zip up bag and ‘massage’ to mix all ingredients well. 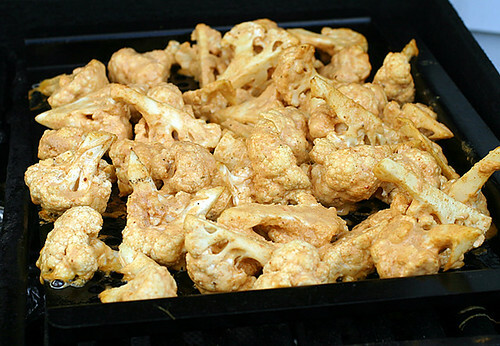 1 Head of Cauliflower Cut into large, bite-sized pieces. Let marinate for at least two hours. Lemon Juice over the top. Hi, this is a wonderful way to prepare cauliflower…tandoori …gosh who would have thought of this…:) Thanks for sharing such a great recipe . 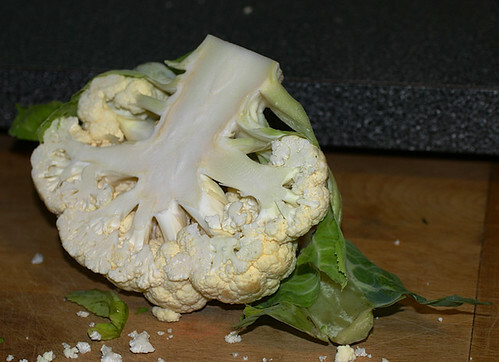 I am going to get my cauliflower when I next visit the supermarket and try this out. This is awesome ! I love cauliflower, usually i steam or boil it for a little bit then saute it in butter and lots of cayenne and cinnamon, it may sound weird but the heat of cayenne and warmth of cinnamon makes it delicious. I have one head of cauliflower in the fridge, I’ll definitely try you recipe these days. Thanks for sharing . Cauliflower was pretty much the only other vegetable I ate other than green beans. It was my entre into veggies. Being a huge tandoori fan, I’m loving this! I think cauliflower is so overlooked. Dry frying it in a little butter with salt and pepper, or turning it into Tandoori as you have, brings out a whole new dimension. Grilling just completes the transition… excellent! I need to make that, even if I would be the only one in my family! Rats, and I am grilling out tonight too! 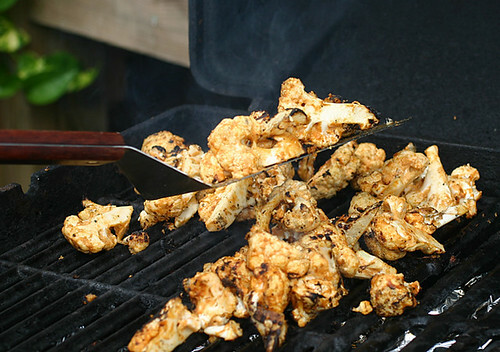 Thanks for the idea – never would have thought of grilled cauliflower! I just love cauliflower but find myself having a hard time figuring out different ways to prepare it. This is fantastic!! A yogurt marinade, I love it!! Thank you– got to try this on my raclette grill! CONGRATS ON MAKING IT TO THE NEXT ROUND! I had no doubt you wouldn’t though! Actually, I love cauliflower and this treatment sounds fantastic.